According to new research from IDC, smartphone vendors will ship more than 450 million smartphones in 2011 compared to the 303.4 million units shipped in 2010. Moreover, the smartphone market will grow more than four times faster than the overall mobile phone market. Read IDC press release here. This is big news. One of the primary reasons people like me wouldn’t, up to now, switch from iTunes, is that my iPhone is also my music player. I have hundreds of songs on it and if couldn’t take that with me to a new Android phone that was a deal killer. Now, I can upload ALL my music to the new Amazon cloud and stream it to an Android phone. I will wait on the reviews to see how smoothly the service works, but that combined with the fact that I cannot reliably use my AT&T iPhone service even in downtown San Francisco may compel me to finally make the switch. So I’ll be carefully evaluating the Android phones (and Windows Phone) against a new Verizon iPhone. This is a big step in the right direction. UPDATE: Reviews are coming in and they are extremely positive. We’re publishing a daily e-newspaper which compiles articles, postings, tweets etc from some of the people we check on daily to stay on top of tech sector. Don’t forget to follow us on Twitter (@insequentco) and/or subscribe to this blog. Any other influencers we should follow please pass along. This is a great video posted by Om Malik where he interviews Steve Blank, co-founder of E.piphany, author of The Four Steps to Epiphany and Professor of Entrepreneurship at Stanford. He talks about where he sees the so called “bubble” many think we are in, and compares/contrasts now with the mid-90s through the dot com implosion of the early 2000s. Very good stuff. Just as in the 90’s everyone started putting their website URL into marketing, packaging, signage etc it is now time to put your “mobile URL” in all the same places. I’m talking about “text keyword to short code” as a call to action everywhere you would put your website and phone number. It’s probably more important than either of those. Ask consumers to Text to Join, Text for a 10% Discount, Text for a freebie, Text for more Info, Text to Follow, Text to Win, Text for Upcoming Schedule, Text for Special Offers….you get the point. Have them text you this way and not only will you pick up new business (if your offer is compelling), but you will also capture their number for future communications with them. Build your mobile database and send out an offer if it looks like you’re going to have a slow night. Or if you want to blow out some expiring product. Or offer a special deal or announce a special event. Get creative but just make sure you get mobile with a “Text to short code” call-to-action in ALL your marketing. Your customers are mobile. Make sure they can connect with you that way. Get new customers, and keep them coming back. Your “Mobile URL” makes all your marketing interactive. What are you doing with mobile that is working? I’m very happy to have Michael Romaner join our Advisory Board. Michael has a rich history of leadership in the newspaper industry of which InSequent is now an active participant. Michael Romaner founded Morris Communications’ (www.morris.com) Division of Online Services in 1995 as the Internet publishing support arm for Morris business units. Later, as the division began selling technology, consulting and development services to other companies across the country, it was re-established as Morris DigitalWorks and Michael became its first president. Today, MDW continues to provide technology and publishing solutions to Morris businesses and supports dozens of local, regional and national websites, many having won major awards for their leadership in the field. But MDW also provides software and web-development solutions to many major U.S. media companies, as well as leading companies around the world. Michael is a board director of the Newspaper Association of America. He served as a president of the NAA’s New Media Federation. He served as chairman of the Yahoo Newspaper Consortium and is currently on its executive committee. He has also served on the advisory boards for the American Press Institute’s Media Center and Editor & Publisher Interactive. This is from a study by Blaze.io which downloaded thousands of non-mobile optimized web pages from Fortune 1000 companies. Android bested iPhone 84% of the time. 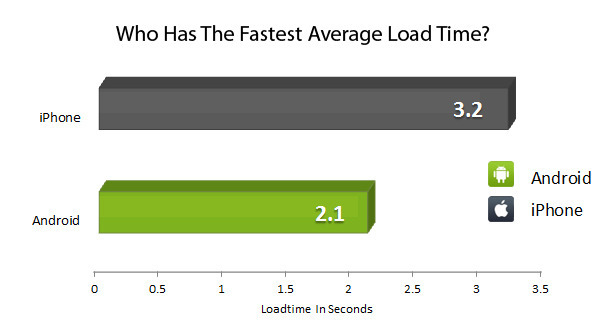 Optimized mobile web pages, however, loaded at the same speed.